Brought up by her mother in a spirit far removed from Christian piety, Venerable Taisia led a wanton and depraved life. Renowned for her beauty, she enticed many to the path of sin. Word of the harlot Taisia spread throughout all Egypt and reached the Elder Paphnuty, a strict ascetic struggler who had converted many of the lost to Salvation. Attired as a layman, Paphnuty came to Taisia and asked her to meet him someplace where neither people nor even God Himself would see them. Taisia responded that this was impossible, for God is everywhere present, and sees and knows all things. Seeing this glimmer of the fear of God in her, the elder revealed his identity to her. He showed her the full severity and vileness of her sins and told her that she would have to answer before God for the souls of those she had seduced and destroyed. St. Paphnuty's words so touched the sinner that, gathering up all of her riches acquired on the shameful path, she burned them in the town square, and went with the elder to a monastery, where she spent three years in seclusion. 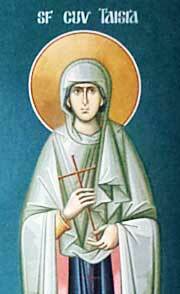 Turning to the East, Taisia unceasingly repeated this short prayer: "O My Creator, have mercy on me!" 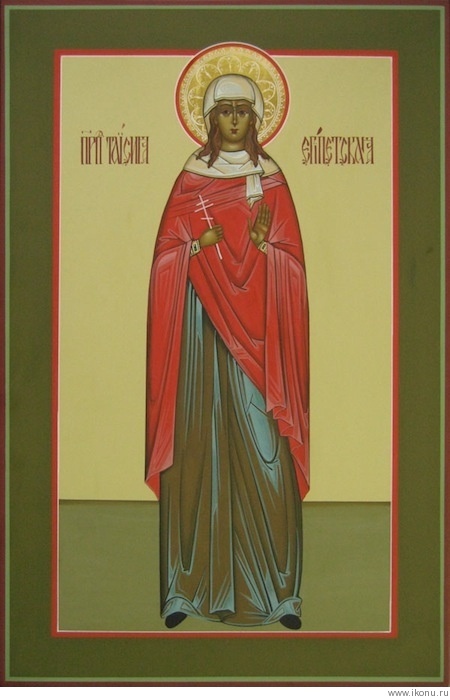 Before her repose, Venerable Taisia told the elder, "From the moment that I entered this cell, all my sins were constantly before me and I wept remembering them." The Elder Paphnuty answered, "Because of this, and not for the strictness of your seclusion, has the Merciful Lord shown you His mercy."